Running the Round The Mountain track earlier this year – it’s a rough & rugged trail! Since returning from the UK in July, after the brutal assault on body and mind that was CoastPathRun, I have little by little been returning to fitness and starting to look ahead to more great running adventures. Ticking away at the back of my mind is an awesome concept for a multi-day (well, actually multi-week) challenge that will combine my twin passions for trail running and scaling peaks. But it is a huge undertaking and 2013’s priority is to build our new family home in Wanaka, something that we have been dreaming about for many years now. So it will probably be at least 2014 before that mother of all adventures happens. In the meantime my ever-present itch for audacious challenges continues demanding to be scratched. I have resolved therefore to undertake a few smaller-scale, but still epic missions, to keep this restless and insatiable part of my being from driving me totally bonkers. And it is time to reveal the first of these, which is planned for mid-December, just a few weeks away….. The Tongariro Up, Down & Around is something which, as far as I know, has never been done before. Starting from the Chateau the plan is to circumnavigate the Tongariro National Park on the Round The Mountain and Tongariro Northern Circuit tracks, along the way climbing to the highest points of Ruapehu, Ngauruhoe & Tongariro itself. Starting and finishing at The Chateau, and accompanied by three keen, strong fellow runners – my good mates Steve Neary, Darren Blackwell & Hamish Travers – this will take in some 100 km of notoriously rugged trails, involve about 6,000 metres of vertical ascent & the same of descent, will call for the use of ice axes and crampons on at least one of the peaks, and will most likely take around 30 hours to complete. We will be doing this largely unsupported, so there is much planning to do to maximize our chances of success. The sense of anticipation and excitement is building for all four of us. It’s going to be huge; it’s going to be memorable; it’s going to be AWESOME! We will keep you posted and attempt regular updates on our progress over the weekend of December 15/16. Let’s just hope the weather is kind. This entry was posted in Great runs and tagged epic adventures, Ngauruhoe, Round The Mountain, Ruapehu, Tongariro, trail running, ultra running. Bookmark the permalink. 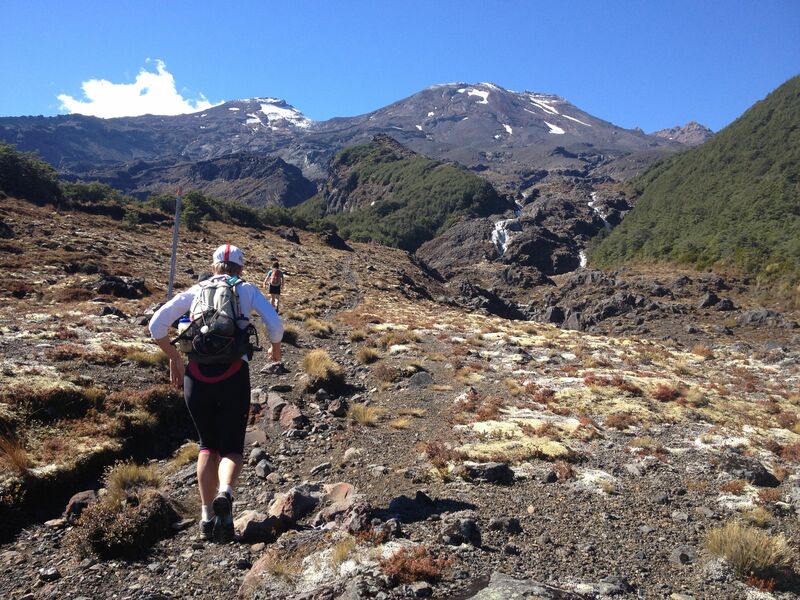 3 Responses to A Tongariro Epic! Definitely sounds EPIC! and definitely sounds like one of Mal’s awesome ideas! Best of luck boys! Looking forward to the updates! This looks awesome, good luck!! Look forward to seeing the photos.